Handcrafted Bohemian jewelry is part of a recent trend toward more natural, unique fashion styles. With unusual combinations of simple materials and bold use of natural elements, this environmentally-conscious jewelry makes a true fashion statement. Bohemian style originated in Eastern Europe centuries ago, frequently associated with gypsy and nomadic populations. Today, Bohemian jewelry is most often associated with new age, free-spirited individuals. While there may be a pattern to Bohemian jewelry - the same number of beads in a repeating format, for example - the symmetry is not rigid and the individual differences of each piece are celebrated. In one necklace, for instance, five beads may have a similar shape or color, but slightly different hues, sizes, or surface irregularities give each one distinction. That distinction is one of the core values of Bohemian culture, which values self-expression and individual artistry above all else. Bohemian handcrafted jewelry has a vintage feel that makes it popular across generations. The first wave of Bohemian fashion was in the late 1960s and early 1970s during the "hippie" era, but today celebrities such as Mary-Kate and Ashley Olsen have made Bohemian accessories increasingly popular. In general, Bohemian jewelry uses natural elements and materials to emphasize the wearer's connection to nature and the simplicity of natural things rather than artificial constructs. Bohemian pieces are usually heavy and thick, often using several layers to add texture and dimension to necklaces and bracelets. Chunky items are often classified as Bohemian as well. Long necklaces are the most popular Bohemian pieces, followed by thick bangle bracelets, pendants, and dangling earrings. Bohemian rings are very rare, but are usually large and use tumbled rather than faceted stones because they are more natural and have a less regimented structure. Modern designer jewelry, however, may infuse different collections with Bohemian elements such as flowers, natural materials, and free-spirited patterns. Most Bohemian jewelry is made by hand because it is easier to work with large pieces of material individually rather than with a machine. Furthermore, because uniqueness and personalization is prized in Bohemian style, handcrafted jewelry is better able to include one-of-a-kind elements and individually inspired patterns. Many jewelry artisans focus on handcrafted Bohemian jewelry as a form of self-expression and creativity, bringing even more unusual features to the pieces they create. Coral or shells, especially those with distinctive patterns or unique colors. Turquoise or other natural stones with interior marbling and patterns. Amber, stone, or fossil fragments. Pearls, particularly if they are unusual shapes that would typically be discarded by discerning jewelers. Wire shapes made with copper or sterling silver wire. Carved wood or bone shapes, usually in natural motifs such as animals or leaves. Beads made from any of these natural materials in a variety of sizes and shapes. 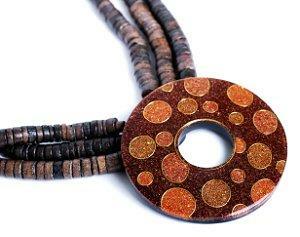 One piece of handcrafted Bohemian jewelry may use a number of different materials or may focus on a single statement. It all depends on the artist's vision as well as the personality of the wearer. Bohemian jewelry is only part of the larger Bohemian fashion world. Long, flowing skirts, cropped jackets, boots, oversized bags, and ragged materials arranged in stylish layers are all fundamental to this type of fashion. They do still adhere to Bohemian values, however, by using natural fabrics, frequently muted colors, and a delicate sense of personal style rather than strict adherence to the rules of the runway. Handcrafted Bohemian jewelry is the perfect way to express personal style and flair in a natural, uncomplicated way. From long necklaces and pendants to bangles and earrings, this jewelry trend is sure to be stylish for many more generations.